The Cat’s Pajamas are the perfect gift for any woman in your life! 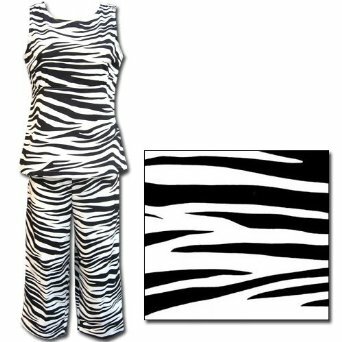 Cozy and comfortable to give her a good night’s sleep, and fun, colorful Zebra animal print to put a smile on her face. Proudly made in the USA, this pajama will last for years of sweet dreams. Tank-style top for comfy, stylish slumber. Capri-length pant has elastic in the back with drawstring in the front for a perfect fit every time. The Cat’s Pajamas sleepwear is the perfect mix of sophistication and whimsy. Once you’ve tried The Cat’s Pajamas, you’ll want to start a collection! Check out our Amazon Marketplace shop to find the ideal gift for all the women on your list: mom, wife, daughter, girlfriend, best friend…or even yourself!